The top three feet of this 6 ft long x 1 in diameter aluminum pole spins on ball bearing to keep the flag from tangling around the pole. Topped with a gold plastic ball. 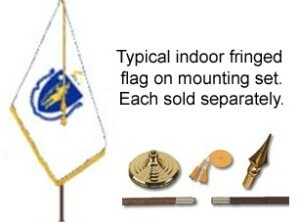 Includes two mounting rings for use with grommetted flags and an upper clip for use with flags & banners that have sleeves. White powder coat finish. Includes seamless shaft of 6063 alloy with satin finish – aluminum revolving cone-style truck with pulley – stainless steel cable internal halyard – manually operated stainless steel winch with removable crank handle – flush mount locking access door – two stainless steel swivel flagsnaps with covers – beaded retaining ring with counterweight – spun aluminum gold anodized ball – spun aluminum flash collar – galvanized steel ground sleeve with base plate and grounding spike. Made in the U.S.A. Prices include delivery in 48 states. 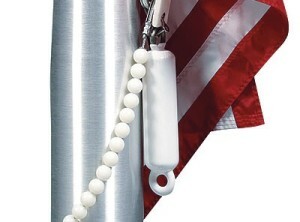 20 ft Silver “Titan” telescoping aluminum flagpole with clear anodized finish. Sections held in place by internal interlocking sleeves, engaged by twisting the section 1/4 turn. 3 in base diameter. Base section has 12-gauge (0.080 in) wall thickness; all other sections are 14 gauge (0.065 in). Includes rotating polycarbonate rings with stainless steel spring clips to hold up to two flags, 3 in diameter gold anodized spun aluminum ball, plastic ground sleeve and 4 ft x 6 ft U.S. flag with sewn stripes and embroidered stars. Flagpole and flag are both made in the USA. 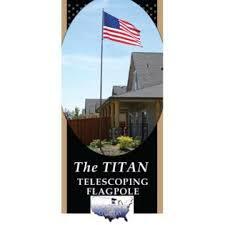 20 ft Dark Bronze (Black) “Titan” telescoping aluminum flagpole with dark bronze anodized finish (nearly black). Sections held in place by internal interlocking sleeves, engaged by twisting the section 1/4 turn. 3 in base diameter. Base section has 12-gauge (0.080 in) wall thickness; all other sections are 14 gauge (0.065 in). Includes rotating polycarbonate rings with stainless steel spring clips to hold up to two flags, 3 in diameter gold anodized spun aluminum ball, plastic ground sleeve and 4 ft x 6 ft U.S. flag with sewn stripes and embroidered stars. Flagpole and flag are both made in the USA. 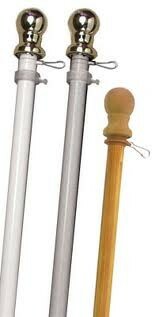 Lightweight aluminum telescoping flagpole. 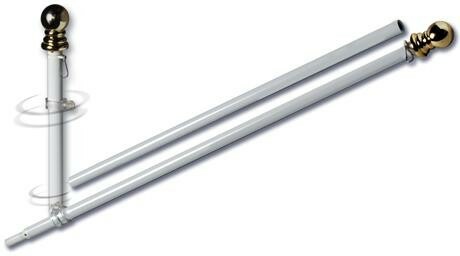 Extend to any length from 44 in to 14 ft – 4 in by twisting each of five sections to lock in place. Wire clips to hold one or two flags of any size up to 3 ft x 5 ft. Bottom section is 1 in diameter and top section is 1/2 in diameter with gold acorn tip. May be hand held or used with tire or ground mounts (sold separately). 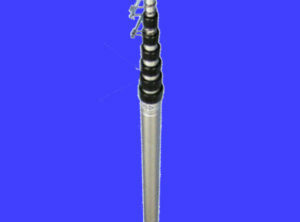 12 in diameter x 3 in high spun aluminum flash collar for the 20 ft or the 25 ft Titan telescoping flagpole. NOTE: The bronze flash collar has a small silver spot on the edge [see photo]. This is caused by the tool that suspends it in the anodizing solution. Only 19 inches long to fit into saddlebags or backpack, this lightweight aluminum flagpole can be extended to 6 feet 6 inches to hold a full-sized 3 ft x 5 ft flag (sold separately). Each of the 7 sections locks into place with a gentle twist.